The 4-5 (or Colony) was one of the first Orthophonic models introduced in late 1925. It was a step up from the lowest priced "Consolette" (VV 4-3) floor model, with extra space to store additional records. As was the case with the other low priced Orthophonic machines, the early production Colony models did not have a cloth cover over the horn opening, and used a small single spring motor. 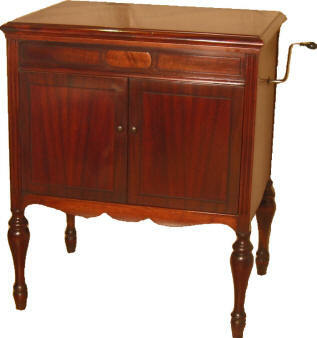 Colony phonographs used the same small unfolded horn as did the "Consolette", and it was basically the same machine in a larger cabinet. A grille cloth and double spring motor was added to enhance the model's value in late December 1925. The Colony failed to sell well, and was discontinued in mid-1926. It was available only in a blended-stain mahogany finish. No electric 4-5's were produced. The original 1925 selling price of the 4-5 was $110.00. An estimated total of 20,000 Victrola 4-5's were produced. The current collector database shows the earliest existent Colony to be S/N 535 and the latest to be S/N 20460. Do you own a Colony? Please take a moment and enter some basic information about your machine into the collector's database by clicking here. No personal information is required.